Known for its exceptional public school system, La Cañada is one of the most affluent communities in Southern California. Residents appreciate its proximity to horse trails and the Foothills. Each summer, neighbors gather for the Music in the Park Series. Don’t plan on traversing many of La Cañada’s neighborhoods on Memorial Day morning, as much of the city is blocked off because nearly everyone watches the annual Memorial Day Parade. The Country Club Estates development was constructed around the golf course. There are several tracts of homes and townhomes. The notable development overlooking the La Cañada Country Club is Greenridge Estates which is comprised of much larger custom homes. Also referred to as Upper Alta Canyada, the Deodar neighborhood stretches from Fairmont Street, north of Foothill Boulevard, between Palm Drive and Alta Canyada Road. The deodar saplings first arrived in La Cañada in 1913 and it’s believed they were five to 10 years old when planted. Some of the trees are now more than 100 feet tall. There are a variety of architectural styles found here including Spanish, Ranch, and Mid-Century Modern. Phyllis had the pleasure of representing the seller of an exquisite Jack Simison in this sought-after neighborhood. 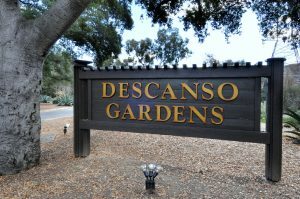 Descanso Gardens is a 160-acre, member-supported botanical garden which features constantly changing exhibits. The nearby homes were built around the Gardens on oversized lots. Most of the homes are the classic California Ranch while others located higher in the hills were built in the 1960s and 1970s, in a variety of architectural styles. Meadowgrove sits at the eastern edge of La Cañada Flintridge, just south of Foothill Boulevard. At one time, the neighborhood surrounded the Flintridge Golf Course. Sadly, in the 1960s, many of its finest estates were demolished to build the Foothill (210) Freeway. After a long wait, new sound walls were constructed which reduced noise from the freeway. Phyllis and Joe had the pleasure of representing both the buyer and the seller of 555 Meadow Grove, an elegant English Revival estate designed by noted architect Ray Kiefer. The boundaries of the La Cañada Rancho neighborhood are east of Gould Ave., north of Foothill Blvd., south of Santa Inez Way, and west of Viro Rd. This neighborhood is bordered on the east by Flintridge Riding Stables and a horse trail meanders through the area. This is one of La Cañada’s more affordable neighborhoods. The boundaries of the Sagebrush District are north of Foothill Boulevard, east of Pickens Canyon, and to the west a north/south line following Rosebank Drive. The Sagebrush neighborhood is part of Glendale Unified School District. During the 1950s, there were just a handful of homes in the area. In the 1970s, La Cañada was incorporated and followed postal boundaries. The Sagebrush District officially became La Cañada, except for the schools that remained Glendale. Many of these Sagebrush homes were designed by Webster Wiley, a prominent architect and developer known for his Mid-Century Modern homes which were constructed in the hills of La Cañada and La Crescenta during the early to mid-1960s. Similar in style to the homes designed by Joseph Eichler, many of these homes incorporated outdoor atriums, post and beam design styles, and open floor plans. There are just under 100 homes in the Starlight Mesa Estates neighborhood of La Cañada. Constructed in the 1960s, these properties have common areas including a swimming pool, tennis court, putting green, playground area, and a large expanse of open landscaping. The community is nearly 40 acres. La Cañada Flintridge is South of Foothill Blvd. The Flintridge neighborhoods of Chevy Chase Canyon, Meadow Grove, and Descanso Gardens have not yet had the opportunity to connect to sewers, therefore waste management is done with septic tanks. Dreaming of making La Canada your home. Contact us for a 15 minute buyer consultation. It’s simple, free, and there is no commitment.